Staff at the Health and Social Care Board (HSCB) recently hosted two charity coffee mornings in memory of their late friend and colleague, Jacqui Magee who passed away suddenly earlier this year. The events, held in the HSCB offices in Tower Hill, Armagh and Belfast were attended by health and social care staff from across Northern Ireland and Jacqui’s family and friends. 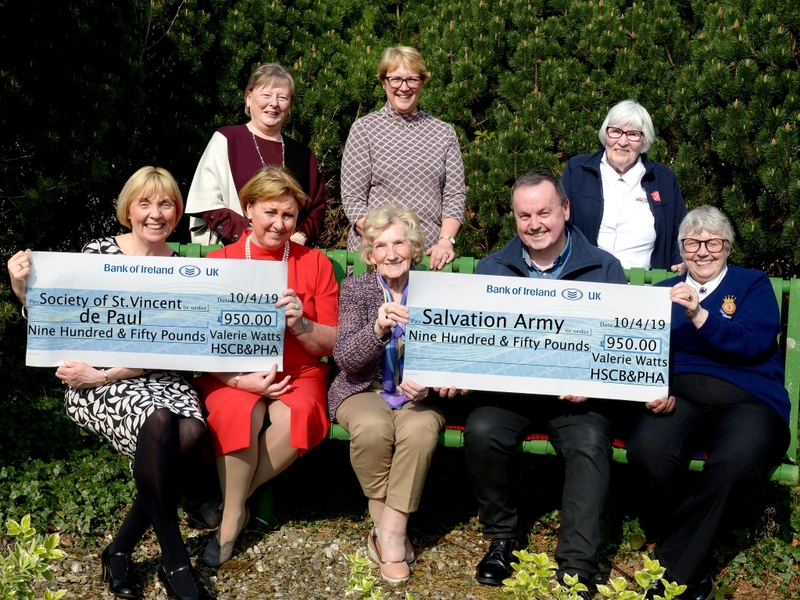 A total of £1900 was raised and two local charities, St Vincent de Paul and the Salvation Army, each received £950 to support those in need in the Newry area. Jacqui, who hailed from the Burren, spent almost two decades working for Health and Social Care in Northern Ireland. She was a tireless campaigner for all services users, working for those with brain injury, wheelchair users, and those with physical, sensory and learning disability and their carers. With her passing the Health and Social Care sector in Northern Ireland lost a champion for everyone and a driver for change, someone who placed the voice and rights of the people first, especially those with disability. Valerie Watts, Chief Executive from the Health and Social Care Board presents representatives of the Salvation Army and St Vincent de Paul with £950 following two coffee mornings in memory of Jacqui Magee RIP. Front row (l-r) Pauline Brown, Regional Manager, St Vincent de Paul; Valerie Watts, Chief Executive, HSCB; Teresa Magee; Anthony Magee and Gladys Thompson, Salvation Army. Back Row (l-) Marian Corrigan, family friend and colleague; Marie Roulston, Director of Social Care and Children, HSCB and Jean Wylie, Salvation Army, Newry.